This page broadly examines the difference between high-income countries and Sub-Saharan Africa, in terms of when and why people die. It is not a comprehensive look at quality of life (it doesn't include malnutrition and other forms of debilitation), but it should give a sense of just how much worse off this part of the world is, for lack of fairly simple and inexpensive treatments and materials. On one hand, people in Sub-Saharan Africa are much worse off, and much more likely to die prematurely, than people in wealthier parts of the world. On the other hand, it's important to note that those who live past age 5 have strong chances of living to age 60 or so; saving a life even from a single cause of death means saving a person who is likely to live quite a while longer. The table below shows the differences between sub-Saharan Africa and high-income countries, in terms of deaths per 1,000, by age range and cause of death. It is color-coded: yellow squares represent causes of death that are noticeably worse in sub-Saharan Africa (a difference of 1+ deaths per 2000 people); orange squares represent causes of death that are much worse in sub-Saharan Africa (a difference of 2+ deaths per 2000 people); and red squares represent the biggest differences (5+ deaths per 2000 people). Data comes from the Disease Control Priorities in Developing Countries, Second Edition report (data from 2001). The biggest differences are before age 5 and after age 60. The major causes of under-5 mortality are malaria, respiratory infections, diarrhea, perinatal conditions, measles, and HIV/AIDS. Between ages 5 and 60, the major causes of death (relative to higher-income countries) are HIV/AIDS, tuberculosis, and maternal mortality (i.e., deaths in childbirth). 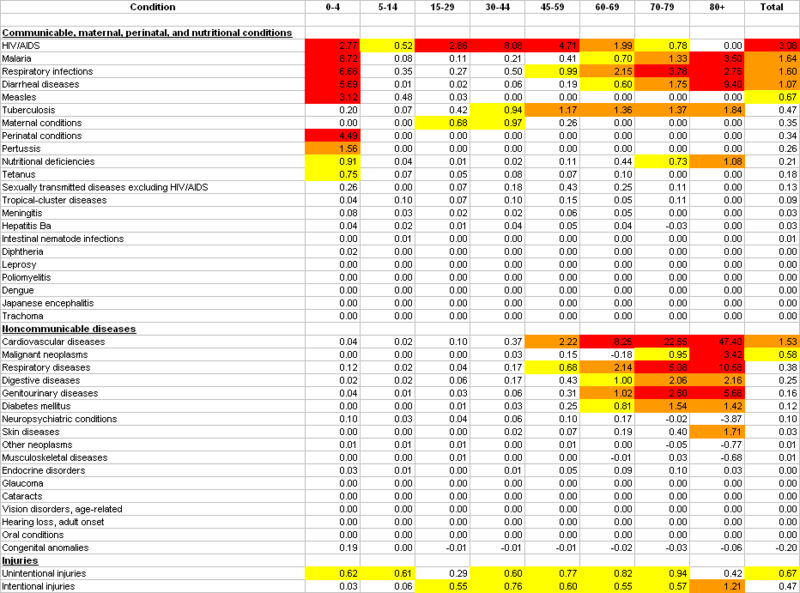 After age 60, there are large differences in the mortality rates for many of the same causes of death that affect those under 5 (we would guess that infants and elderly are similarly weak in terms of their ability to resist these diseases), as well as for many conditions that require advanced medical attention (heart disease, cancer, diabetes). 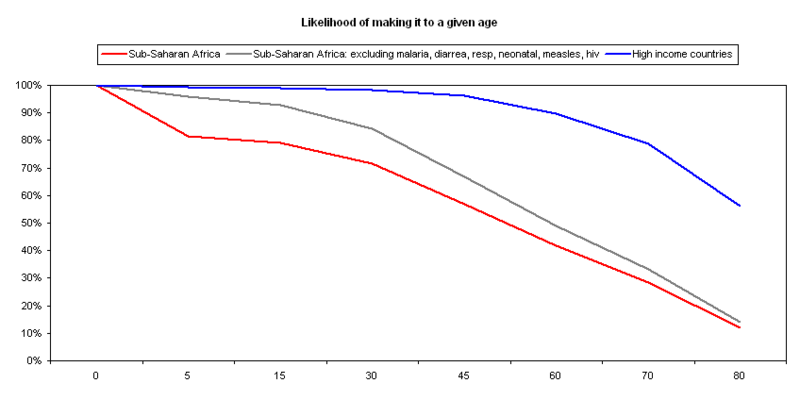 Using the the mortality rates on which the above differences are based, we constructed the chart below, which shows the the probability that a child born in sub-Saharan Africa reaches a given age. We also show life expectancies for sub-Saharan Africa excluding the major causes of childhood mortality (under-5 deaths from malaria, respiratory infections, diarrhea, perinatal conditions, measles, and HIV/AIDS). The horizontal axis represents a person's age, in years; the vertical axis represents the probability that a given person will make it to that age, according to the analysis above.